[Hannah Tamimi, File Photo] Roy Powell spikes the ball past his opponents in a match against California State University, Long Beach. Powell has signed with Habo Volley Club in Sweden. 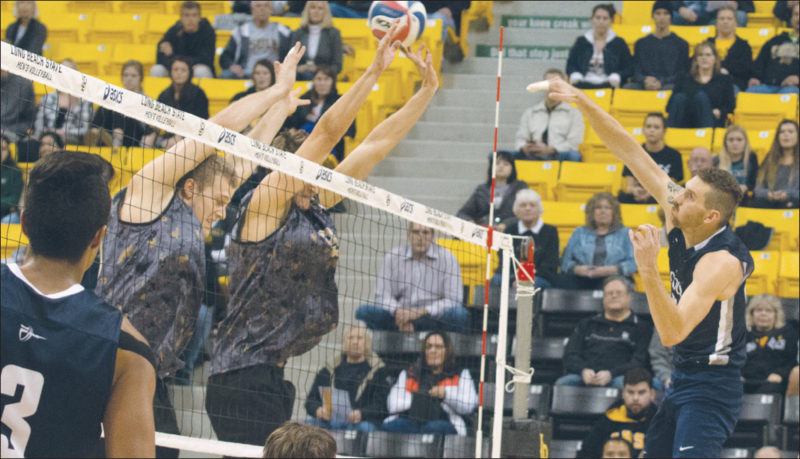 The men’s volleyball team at California Baptist University possesses many talents on its roster, allowing the team to fight through its rigorous NCAA Division I schedule. Some of these talents find themselves with stellar seasons, capturing the attention of professional volleyball leagues. The team is familiar with graduating alumni to professional leagues. Kristopher Johnson, former middle blocker for CBU, was signed to the Leka Volley Club in Finland following graduation in 2014. Johnson is now a middle blocker for Team USA, where he most recently competed at the Pan-American Volleyball Cup in May. Following in Johnson’s footsteps is Roy Powell. The former outside and opposite hitter signed with Habo Volley Sweden Sept. 6. Powell is replacing Joren Zeeman, a former outside hitter for Habo. Alessandro Lodi, head coach of Habo Volley, said in a release that Powell is the type of player he wanted on the roster. Lodi also said he had his eye on Powell because of his physicality and good attitude on the court. Powell will bring some depth to the team with his experience as an opposite hitter. Lodi predicts Powell will be a strong leader on the team. With his ambitious attitude, Lodi said Powell will fit right in with the club and its other players. In a statement to Habo Volley, Powell said he is excited to start this new chapter in his volleyball career in Sweden. Powell said he will no doubt develop with the club and is eager to see what Habo holds in store for his future. At CBU, Powell was a dominant force on the court, finishing the 2016 season with 235 kills, 107 digs and scoring 289.5 total points. Prior to CBU, Powell played two seasons at El Camino College and was a member of the IMUA Volleyball Club. With his signing, Powell became the first IMUA alumnus to sign a professional contract overseas.